Just wanted to share this with ya in-case you wanted to join! Just one of those fun things you find while blogging. 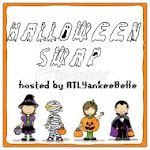 We are participating in our first ever Halloween swap! Hosted by Atlanta Yankee Belle. If you'd like to participate there is still time. Click on the image below to join in the fun! Deadline is Oct 5th!